Last year with your brilliant participation, The Egg Factory raised about 336,364 INR and 62,000 eggs were distributed to the families in DG halli and Koramangala slums. It was a day filled with happiness and joy. As part of Daan Utsav, also known as Joy of Giving Week is celebrated throughout the country from October 2 - 8 every year. As thousands of citizens gear up to celebrate this festival of giving, The Egg Factory and Mani's Dum Biryani has a simple aim: feed a hungry child and put up a smile on their faces. They will be together donating 100,000 nutritious eggs to the underprivileged children on October 14, World Egg Day. Hopefully, we plan to cover several locations and ensure that all the needy children in Bengaluru will each have an egg. With high-quality protein and essential nutrients, eggs are the perfect food to feed a hungry world. 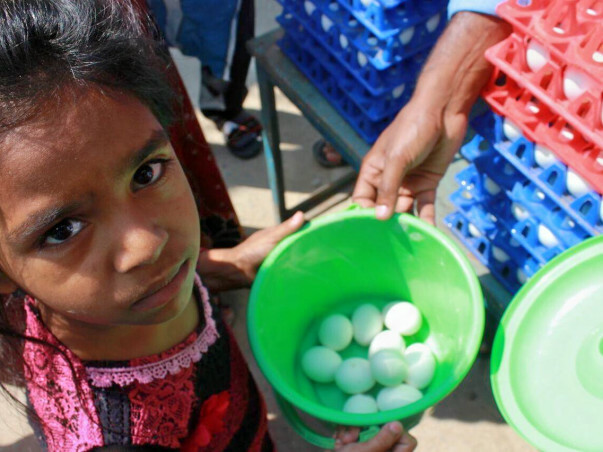 Although handing out eggs might seem like a small step, the idea is to provide them with something nutritious and we are happy to lend out a helping hand to those in need. Let’s make it happen for The Egg Factory and Mani's Dum Biryani. Let’s ensure no child sleeps on an empty stomach on October 14th. Let’s feed the needy. Your support is all that they need. This amount will be used to donate eggs at L. R Nagar to deserving families in backward areas through Swabhimaan - an NGO which has been working in the area since 2000 and support destitute women and children from extremely poverty-stricken areas by providing support with education, health, food, vocational training and other similar needs. Through a similar campaign last year (2016), about 62k eggs were distributed to women and children.